What Part Of An Ohio DUI/OVI Trial Is Most Important? Lawyers disagree on what part of a trial is the most important. Some lawyers say the closing argument is the most important part because that’s when we tie everything together and persuade. Others say the closing doesn’t matter much: trials are lost or won during jury selection. Still others say the most critical phase of a trial is cross-examination. 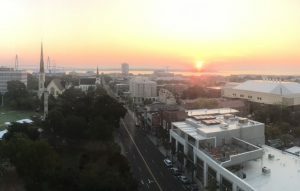 Cross-examination was the subject of a recent workshop in Charleston, South Carolina (a couple days after Hurricane Irma hit! ), and I was part of the faculty for the workshop. 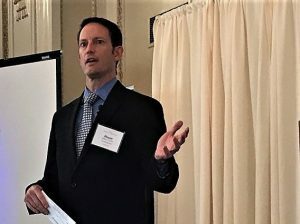 The workshop was part of a three-day seminar presented by the DUI Defense Lawyers Association (DUIDLA), and first two days of the seminar were lectures on various DUI/OVI topics. The third day was a trial skills workshop focused on improving the attendees’ cross examination skills. 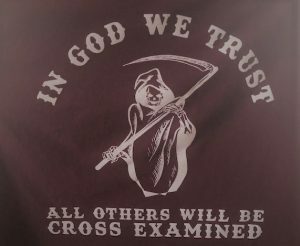 In DUI/OVI cases, cross examination is very important. In all OVI trials, the defense attorney cross-examines the prosecution witnesses. In many OVI trials, there are no defense witnesses testifying, so all of the testimony comes from the prosecution witnesses. Therefore, it is critical for those prosecution witnesses to be effectively cross-examined. In his book Good To Great, Jim Collins discusses ‘the hedgehog concept’. 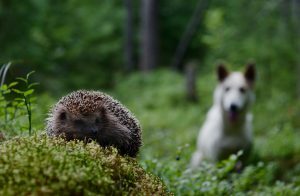 The concept is essentially this: although the fox is a cunning predator, the hedgehog always defeats the fox because the hedgehog focuses on doing one thing well – it rolls into a ball of spiky quills the fox cannot penetrate. The hedgehog concept applies to practicing law: focusing on one narrow area of law and doing it well leads to expertise and effectiveness. 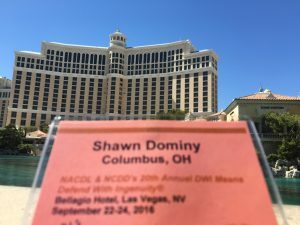 In the narrow area of DUI/OVI defense, one great way to learn is attending advanced level seminars like the summer session of the National College for DUI Defense (NCDD). I recently attended the NCDD summer session at Harvard Law School. 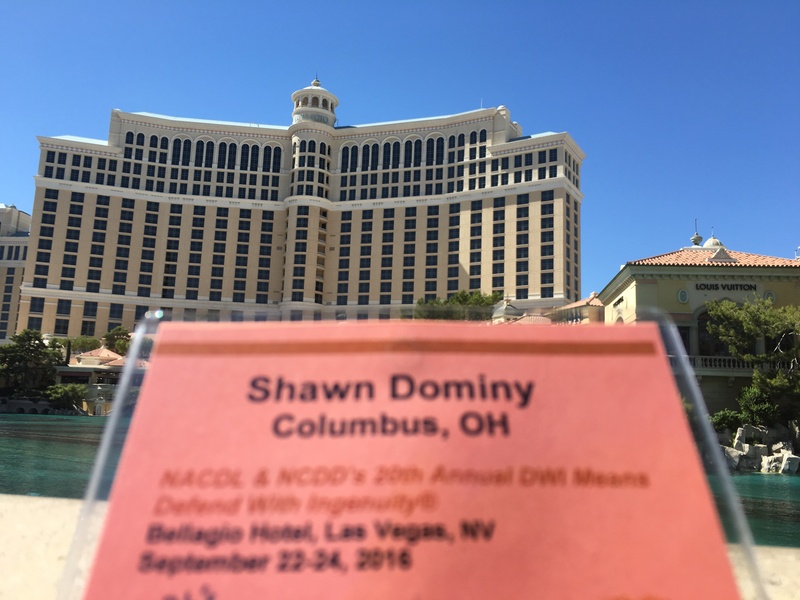 Over the course of three days, some of the best DUI lawyers in the country discussed advanced topics in DUI defense. The seminar included lectures, demonstrations, and workshops. Additional learning took place informally each night as the lawyers exchanged ideas, tactics, and best practices. While all the presentations were informative, there were two presentations which stood out to me: one about metrology, and one about pharmacology. The metrology presentation discussed the uncertainty involved in measurements and explained common failures in the measurement of blood alcohol concentration. The pharmacology presentation compared the work of law enforcement Drug Recognition Experts to that of pharmacologists in DUI/OVI cases involving drugs other than alcohol. Lawyers sometimes learn through trial and error; literally. Education at the school of hard knocks can be valuable, but learning from the experience of others has its own value. One way attorneys can shorten the learning curve is by attending high quality continuing education seminars. 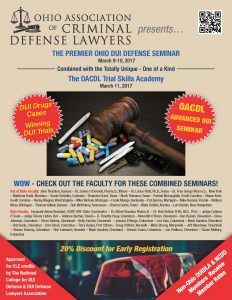 One outstanding annual seminar for DUI/OVI lawyers is ‘The Premiere Ohio DUI Defense Seminar’ sponsored by the Ohio Association of Criminal Defense Lawyers (OACDL). The focus of this year’s seminar, held last week, was drugged driving. Ohio has seen an increase in the number of drivers charged with OVI for being under the influence of drugs. With medical marijuana on the horizon, it’s likely the numbers of drugged driving cases will continue to increase. With that in mind, the presentations addressed the science, the law and the litigation involved in drugged driving cases. Pharmacologist James O’Donnel taught the basics of pharmacokinetics. He described, in terms understandable by non-scientists, the absorption, distribution and elimination of drugs in the human body. Interestingly, he explained why retrograde extrapolation cannot accurately calculate the concentration of a drug in a person’s system at a particular point in the past; like when the person was operating the vehicle. Yes, I saw Carlos Santana perform at the House of Blues. It’s true, I rented a convertible Mustang. I admit I hiked a breath-taking trail in Red Rock Canyon. 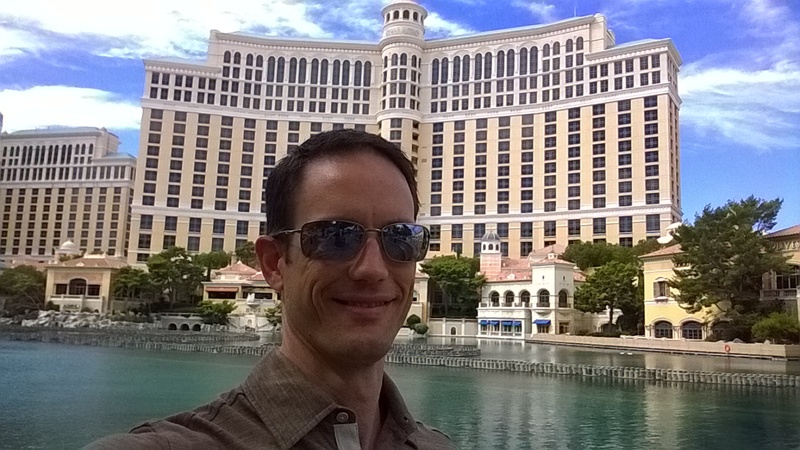 I also acknowledge I enjoyed the luxury of Bellagio and saw amazing views from the High Roller. However: the primary purpose of my trip to Vegas was to learn more about DUI/OVI defense. I recently attended the annual ‘DWI Means Defend With Integrity’ seminar. The seminar is co-sponsored by the National College for DUI Defense and the National Association of Criminal Defense Lawyers. 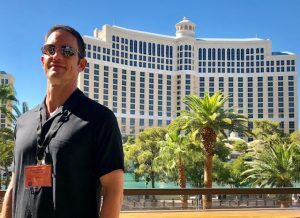 It’s held in Las Vegas each year at the end of September or beginning of October; not a bad time to be in Vegas. 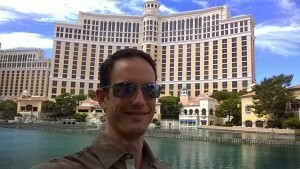 The location has historically been Caesar’s Palace, but for the last two years, the seminar has been held at Bellagio. This year marks the 20th anniversary for the seminar, and I have attended for about 15 years. This is a great seminar. The speakers are some of the best DUI lawyers and experts from around the nation. I have been practicing since 1997, and I have been focusing on DUI/OVI defense since 2002. I feel like I have developed a bit of expertise in this area. When I attend this seminar, however, I always learn more. 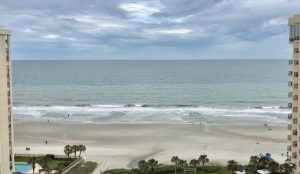 Hearing from the seminar faculty helps me avoid the limiting comparisons of my local market and allows me to benchmark against world class attorneys. It also adds to my box of tools for winning. 1. 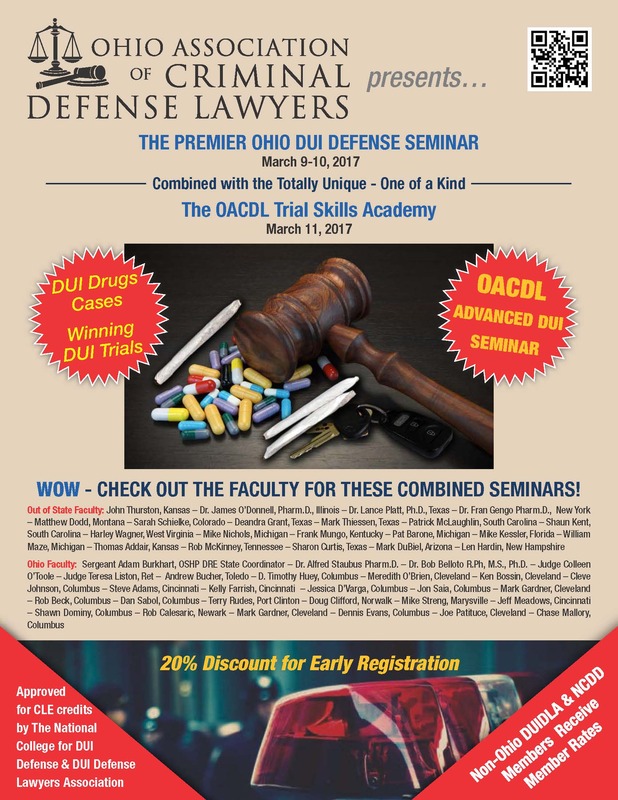 Are there any other Ohio DUI defense seminars? 2. If so, what makes this one the ‘premiere’ seminar? Full disclosure: I co-chaired the seminar this year, so my opinion is probably not unbiased. 2. What makes this one the ‘premiere’ seminar is the topic of this blog entry. One factor which makes the OACDL seminar impressive is the sheer volume of information. The seminar lasts for about 20 hours. 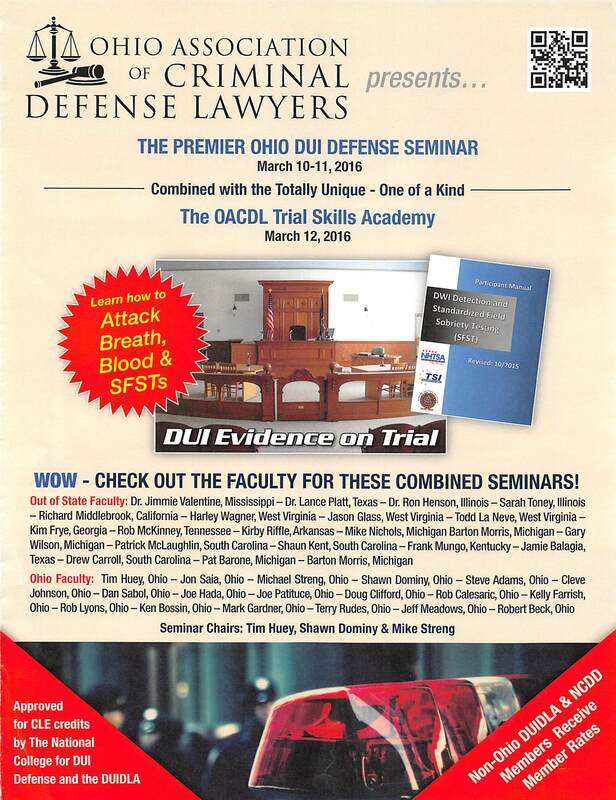 During that time, about 35 speakers give presentations on topics relevant to DUI/OVI in Ohio. 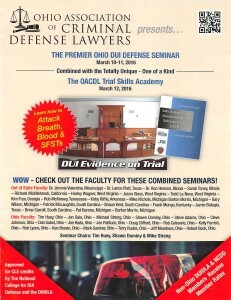 No other Ohio DUI/OVI seminar comes close to providing that amount of information. For some, such a long seminar may sound like a nightmare. For me, it’s time well spent.